Villa Fortuna Casino offers an unmatched casino experience for players who want to take up the challenge playing on some of the best games around with a pleasant reddish interface, quick and easy to navigate. The multiple winning opportunities and a large amount of freshly updated options make players keep on coming back to this place. Logging in is as easy as ever just by connecting through your Facebook account in just a couple of clicks or via regular e-mail. Although Casino Villa Fortuna is amongst the leaders of the European online casino market, it’s available in the US and other world regions in various languages such as English, French, Italian and German. Villa Fortuna looks after its new members by making sure they always receive a satisfying real money no deposit bonus of 30 Free Spins using coupon code: MONSTER30. 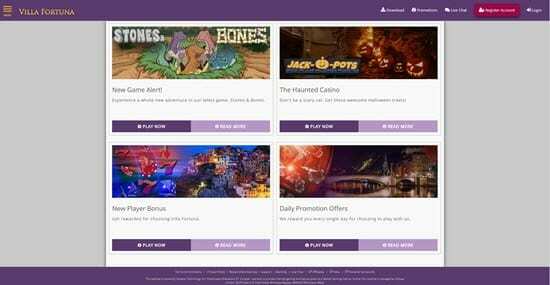 Over first four deposits the casino offers up to $/€/£1000 and the opportunity to enter Villa Fortuna Casino no deposit bonus codes when depositing. As it is, on your first deposit you receive 100% match up bonus up to $/€/£250 (Code: VFPW1). On the second deposit you receive a 50% match up bonus up to $/€/£250 (Code: VFPW2). Third and fourth deposits give you match bonuses up to $/€/£250 (bonus codes VFPW3 and VFPW4). Fourth deposit deal is a great 110% match offer! At weekends members can enter medal tournaments with plenty of cash splashed out on specified times of period with two real money games available during this promotion. Members are also entitled to Loyalty Benefits Packages and a chance to win $/€/£1200 throughout the whole week. 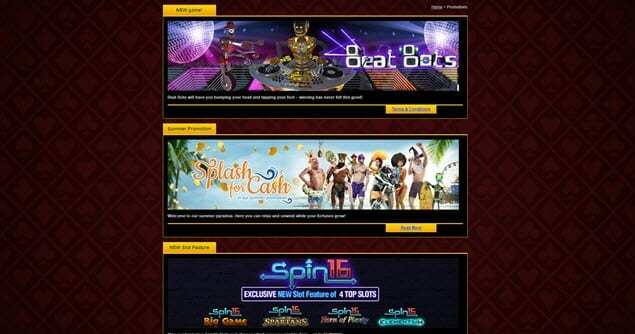 You may scroll down through the list of offers that keep on being added including the Villa Fortuna Casino Free Spins offers. 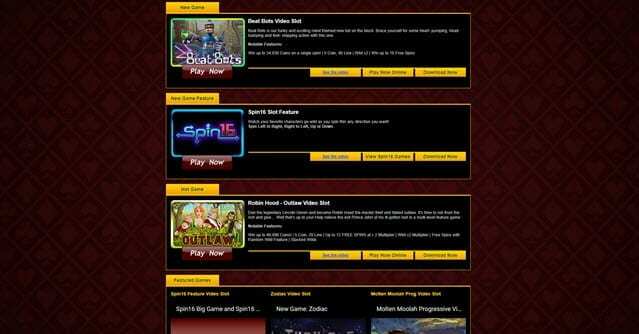 Saucify is the game developer for this casino providing Video Slots with progressive jackpots like Robin Hood, Outlaw, or Classic Slots like Small Soldiers and Buckin’ Broncos. Table Games include Vegas Strip Blackjack, American and European Roulette, Baccarat and Craps. Also a Specialty games selection plus a wide Video Poker section with one-hand and multi-hand games. A support team can be contacted through a live chat 24/7 Monday-Friday in English, and in German or French at weekends. A toll-free telephone number from six different countries is available. 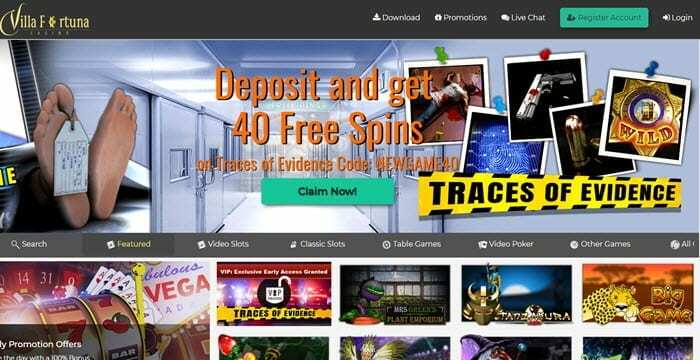 Villa Fortuna keeps your personal and financial data safe from any third parties with 128-bit SSL encryption technology and holds the seal of approval by iTech Labs for gaming fairness and randomness. Unfortunately the casino doesn’t accept players from either from Poland or South Africa, whilst Australian players are only allowed to play on slot games.